If you know anything about Pra, you know that I adore anything to do with the Virgin Group, which is why I decided to visit Babylon Restaurant in London whilst visiting the UK a few months ago. 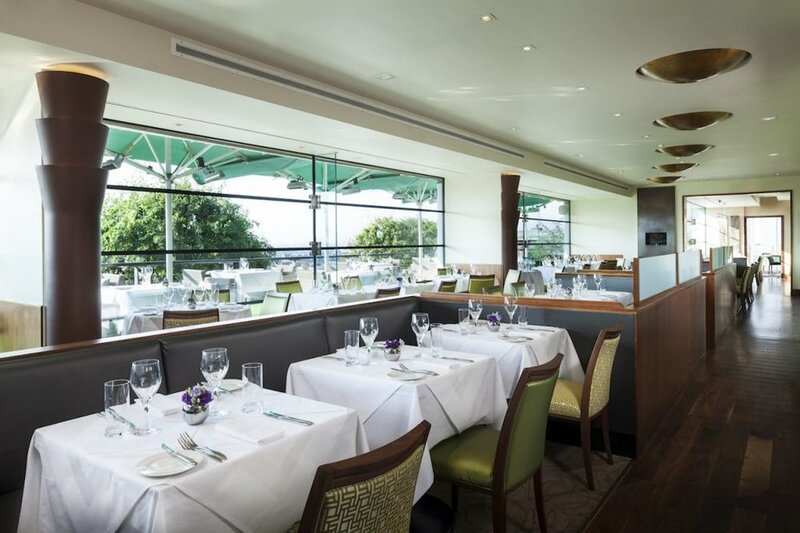 This restaurant has a stunning view of the city skyline and The Roof Gardens in Kensington and is part of the Virgin Limited Edition group. Serving contemporary British cuisine using fresh, seasonal ingredients, the kitchen is led by Chef Ian Howard, with whom I had a chance to do a Q&A. When Chef Howard set foot into Babylon seven years ago, it was more or less love at first sight. First impressions go a long way and he was completely sold the moment he arrived at the restaurant. Not to mention that it’s located in an iconic London venue and is a part of Virgin Limited Edition—if any restaurant is going to have clout, those two extras will probably do the trick! Although he may have been wowed by Babylon, the chef’s own background is nothing to scoff at. He moved to London at the age of 24 and began working at the Hilton Park Lane. Following that, he worked at The Savoy under Anton Edelmann, The Landmark London, The Belvedere, and the Harrington Club (Ronnie Wood’s former private members club). Finally, he was the head chef for Gary Rhodes at The Cumberland before landing at Babylon. Since joining, he’s had a huge hand in the sustainability aspect of Babylon. The restaurant has developed a relationship with the Sustainable Restaurant Association and has maintained a 3-star Food Made Good accreditation for the last 5 years! Sustainability is the driving force behind the menu and the chef pays a lot of attention to the sourcing. Chef Howard ensures that their suppliers are as local as possible, meet their sustainability values, and offer the best quality ingredients. The menu changes with the available seasonal produce so the restaurant relies on the suppliers to provide the best of the best. Oftentimes, the chef goes out to meet them and he encourages the rest of the team to do the same in order to form strong working relationships as well as become familiar with where their ingredients are coming from. The chef also looks to The Roof Gardens for menu inspiration by planning regular meetings with the Head Gardener to see what herbs she’s growing and how he can incorporate the vibe of The Gardens into the Babylon’s modern British cuisine. Each dish is carefully thought out so that there is a balance between presentation and textures. Their Roasted Scallops starter, for example, combines crunchy bacon and pork rind offset by the soft scallops. The pea puree, a gorgeously vibrant green, offers the perfect contrasting background to the delicate golden hue of the roasted scallops. Chef Howard’s team works tirelessly to create and keep up with constantly changing menus but this also helps them stay engaged and invested. He keeps them motivated through mentoring, training, and teaching. All of the Sous Chefs started off as Chef de Parties and he has found that being able to see this clear progression is a massive motivating force for the team. When the chef needs to hire new staff, he always looks for a passion for food (obviously) that is accompanied by a hunger to learn. He knows that anyone who joins the team is coming in with the mindset that they’ll one day be Head Chef of their own kitchen and he encourages them to work towards that goal. His own motivation and inspiration come from Marco Pierre White, who was really making waves in the industry during the time Chef Howard was doing his youth training scheme back in the day in Portsmouth. As the youngest chef to be awarded 3 Michelin Stars, Marco Pierre White demonstrated to many young chefs that if you put in the hard work, there’s no limit to what can be achieved. That’s something the chef has carried with him throughout his career and the results are evident! At Babylon, Chef Howard makes a point of paying attention to the customers and learning to understand them. The restaurant is about “relaxed dining”, meaning the service is friendly and the goal is for the guests to leave feeling like they’ve had a fun time with them. The team is always thinking about creative, new ideas to enhance the dining experience, like the ’50 Shades of Lady Grey’ cocktail that is served in a teacup or the fish tanks in the bathrooms. The Babylon team thrives on surprising the guests and presenting the unexpected! Oh, and one more thing: if you want to join Chef Howard’s kitchen, it’ll help to have a good sense of humour and a cool head, as well! Best meal you’ve had in the UK apart from yours? The Square Restaurant in Mayfair; I’ve visited several times but I remember one stand-out visit around 10 years ago that really impressed me. Not only was the food unlike anything I’d tasted before; the service was exceptional and it really demonstrated how important the overall experience is. That’s something we try to create at Babylon too; food plays a big part but it’s just one piece of the jigsaw. Albert Adrià’s restaurant Tickets, in Barcelona. It’s fun, relaxed and the dishes are seriously good; I loved their oysters. Can I have two? Cool and Calm.